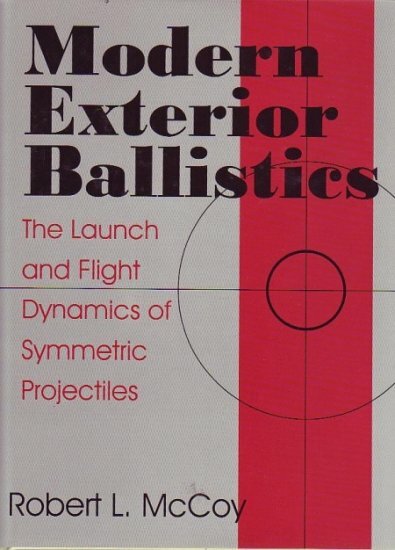 In 1998, Robert McCoy gave the shooting sports community a gift - his book, Modern Exterior Ballistics: The Launch and Flight Dynamics of Symmetric Projectiles. We all suffered a great loss when he passed away, mere months after his book was finished. It is the best up-to-date overview of the math and physics used by modern ballistics engineers that I have come across. As such, it breaks away from the historically interesting, but antiquated techniques used by ballisticians in times when computers were not available and calculating a single trajectory was a substantial effort. Robert McCoy was a ballistician at the Army's Ballistic Research Laboratory for over 30 years, and his expertise in and passion for the subject shows in his writing. The book covers topics that are of interest to both sport shooters and military balisticians. Both small arms and artillery are covered, although the treatment of fin stabilized and/or rocket propelled projectiles is limited. The focus is on dumb lead bullets fired from small arms for the most part. This book contains heavy-duty math throughout. It would be appropriate for a junior or senior level college engineering course, and assumes a solid background in calculus, differential equations, and numerical methods. If you don't have that background, you will not understand most of the math. However, there is a good deal of information that you will understand, and you can usually glean at least some understanding even if you skip the numerous equations. Unfortunately, the book is poorly edited and riddled with typos, many of which are significant errors in vitally important equations. Fortunately, some smart, dedicated people have combed through them and provided a complete set of corrections, which you can find on the internet here. Make sure you download the corrections and keep a set with your book - it will save you a lot of head scratching. Chapter one begins with Isaac Newton and takes the reader through a fairly detailed history of ballistics all the way through the efforts of the BRL in the late 20th century and some speculation as to the future of modern ballistics. Along the way, McCoy provides accounts of the origins of the various drag functions, including detailed sketches of the the standard projectiles. A good bit of information on World War II era investigations is given, which one might call the birth of modern ballistics. Shadowgraphs of various projectiles (spheres, cylinders, cones, and missiles) are also shown with some commentary. The chapter winds down with an overview of post-war progress, including computer simulations and the potential of computational fluid dynamics to provide greater insight. The non-engineer will have no trouble with this chapter. It's packed with lots of interesting ballistics history, and well worth the read. Chapter two is a little dry. It's a walk through of all the forces and moments that work on a projectile in flight. It's the groundwork that is necessary for later chapters. There is some commentary along the way, written in McCoy's welcome informal tone that is so often lacking in "real" text books. If you paid attention in high school math and physics class, you should be able to follow this chapter. But don't worry if you can't - it's mostly relevant to those who want to dig into the meaty math in later chapters. Chapter three takes the reader through the basics of what a trajectory looks like in a vacuum - in other words, a trajectory where the only force acting on the bullet is gravity. The math in this chapter is at the college freshman level. A foggy memory of your first semester calculus should get you through it, and you can get away with skipping the math for the most part - you'll still find interesting bits in there. A nice section on the effects of firing up and down hills is presented. This will be of practical use, and demands nothing more than a working knowledge of trigonometry. One of the more interesting chapters in the book, Chapter Four describes in detail the concept of a drag function, the reasons they exist, and their limitations. Full page shadowgraphs of a bullet transitioning through the transonic range with play-by-play commentary provide a look at why this region is so tricky to navigate in the real world. A section on the effect that a bullet's shape has on drag is fascinating, but leaves the reader hungry for more. I can't read this chapter without feeling like I need to design a better bullet. Among other interesting notes is a section on tracer rounds and the effects the burning pyrotechnic mixture has on drag (or more accurately - thrust). This chapter is perfectly accessible by someone without a deep background in mathematics. Some knowledge of fluid mechanics will make it a little more interesting, but is not required. This is where we get to calculate a trajectory in air - but only if we make some simplifying assumptions. The reader will find the derivation of the equations of motion of a projectile in still air (without wind). A solution of those equations can be found if one makes the assumption that only small angle of fire trajectories are interesting (the flat-fire assumption). This chapter is too basic for practical use, and has limitations that we can get around by using methods in later chapters, but the math is relatively simple - requiring only basic calculus to wade though. This method predates computers substantially, having been pioneered in the early 18th century by Johann Bernoulli. In the late 19th century, Col. Fancesco Siacci developed an approximate solution to the flat-fire problem, which made solving the equations considerably less labor intensive. The Siacci method was used by the US military until sometime around World War II. Although inadequate for artillery, it provides good accuracy for small arms fire. The shooting sports industry has made good use of the Siacci method for many years, and continues to do so, in spite of it's limitations. Finally we get to a matter near and dear to the hearts of long range shooters: wind. McCoy begins the chapter by deriving the equations of motion for a point mass trajectory including wind and a flat-fire simplification that permits a nice analytical solution (the equation that lets one calculate wind deflection). This short chapter requires an understanding of differential equations, and is frankly, not that interesting, unlike the next chapter. Professional ballisticians and academics will enjoy chapter nine. This is the grand-daddy ballistics model of them all. It calculates the complete motion of a bullet - displacement and rotation in all three directions. The math in this chapter is as bad as it gets. It's a handful, and I got bored following it. That's mostly because I can't use it. The 6-DOF model requires huge amounts of measured data (analogous to a BC) for every bullet, and that data is simply not available to most of us. Nonetheless, there are some interesting and significant effects that get uncovered by the 6-DOF model that will not show up in the point mass (3-DOF) model - the effects due to bullet spin and yaw. The chapter ends with a simplification of the 6DOF model (the so called Modified Point Mass Model) that allows for the calculation of spin drift and some of the yaw-based drag effects. It's basically the 6-DOF model with a bunch of forces left out. Even so, it's not light reading. In another mathematically dense chapter, McCoy examines the pitching and yawing of a spinning bullet. The interesting part of this chapter is the discussion of gyroscopic and dynamic bullet stability. Unfortunately, you can't calculate it unless you're a professional with access to the proper data. On the other hand, it is helpful to see that there are indeed two requirements for stable bullet flight, and that unstable may not mean exactly what you think it does. You guessed it - more high level math. This chapter is a continuation of chapter 10 that discusses the effects of yaw and spin on bullet trajectory. Specifically, that means epicyclic swerve (the corkscrew flight path), spin drift, and aerodynamic jump (more on this in the next chapter). The take-away from this chapter is that drift and epicyclic swerve, while interesting, are not terribly large effects when compared with aerodynamic jump. This is the most interesting chapter in the book. There is some tough math, but it can be skipped by those who don't have an interest in following it. It's a discussion of two spin-induced effects on trajectory that have real and significant impact on rifle accuracy: aerodynamic jump and lateral throwoff. Lateral throwoff is the effect whereby a bullet with an off-center center of gravity (or a bullet that yaws in-bore) "jumps" off the bore centerline when it exits the muzzle, resulting in an angled trajectory (in other words, poor accuracy). Aerodynamic jump causes a similar change in the flight path, but for different reasons. Aerodynamic jump is caused by wind, unbalanced bullets, and in-bore yaw. A fascinating consequence of aerodynamic jump is that a cross wind will cause a vertical deflection (that can get particularly nasty when firing out the side of an airplane). The take away from this chapter is to buy the best bullets you can, and to use the slowest twist that will stabilize them. This chapter is the most difficult to understand in the entire book. Honestly, I lost interest in this chapter because it delves so deeply into what, to me, is only of academic interest. Those able to wade through it's dense contents will find some interesting thoughts on dynamic stability. Perhaps I will return to it at a later date with more enthusiasm. Brush up on your dynamics before reading this - it's a beast of a chapter. All in all, McCoy's book belongs in every serious ballistics enthusiast's library. It does not dive deeply into any one topic, but provides enough clues that the reader will know where to look next. It has an extensive bibliography, but unfortunately, many of the interesting titles are BRL papers, which you won't find at the local university library. (And if you do have copies of any of those papers, please send them my way!). It's a fantastic book that will be of interest not only to engineers, physicists, and mathematicians, but also to technically-minded shooters. You can find it on Amazon.com .